Ever notice the container on the back part of the et al parking lot? I never paid attention to it either. In January of this year, the owner Kim Ramin went through the proper channels with the town to get a container that resides on her property and was using for some storage as she was getting her new place together. Note the container removal date is “TBD” – To be determined, meaning no fixed date of when it has to be off premises. 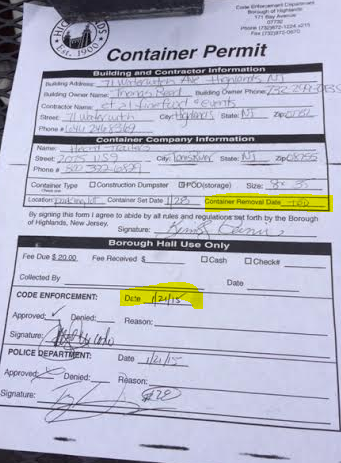 Then, and here’s the weird part, the next day May 7th, her tenant, Kim Ramin, is issued a summons for illegally having a container on her property – and its mailed (not brought over, but mailed). 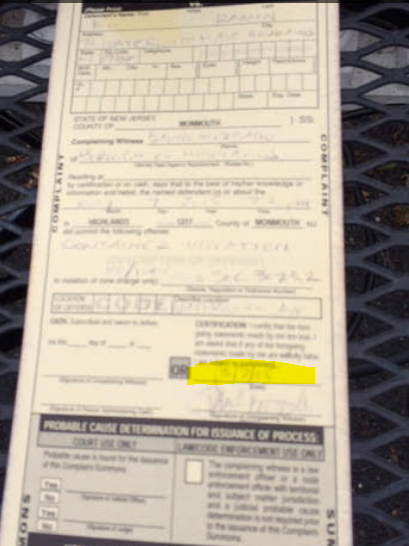 So this week she receives the summons that states she has a June 2nd court date for a container she has a permit for and if she doesn’t remove it by *this* Saturday (which is Memorial Day weekend) she will be fined everyday until it’s removed. 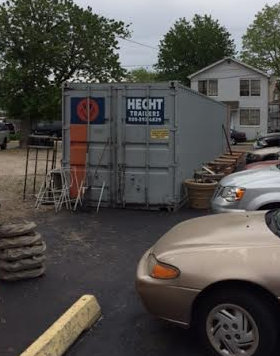 Kim called Hecht the container company and surprisingly they couldn’t schedule a pick up within 3 days. She did go and schedule one which unfortunately can’t be until June 14th. In last night’s council meeting, this was brought up and our town administrator said he knew about it and our code enforcement officer was responding to a complaint about the container. Welcome to Highlands et al! You May not have gotten this. During WWII Highlands was a small fishing village of about 2000 people. For a little town it was intensely patriotic and sent its young men to war in numbers that far exceeded most other N.J. towns of the similar size. Sadly, several died in battle defending their country. Those who did not return were Eugene Arnate, Samuel Parker, Kenneth Furey, George K Hauber, Robert S Matthews, Edward Minor, Charles Rugg, Leroy Smite, John N Green, John Ryan, Louis Mount, Willard Robertson and Michael O Patterson. Their names are inscribed on the monument in Veterans Park. I worked with Russ Card President HSH to try to trace what happened to these brave men. Only a few can be accounted for. Here are the replies we received from family members who have not forgotten them. The others have been lost in history. Attendance at our Memorial Day Parade has dwindled over the years and only a handful of people show up at the Veteran’s Park ceremony that follows. Highlands has a tradition of being passionately patriotic. Come to the parade Sat may 23 at 1:00pm Lets revive this spirit and not forget these heroes, our veterans of all wars and those currently serving..
Dolores Howard Russell, my uncle Willard Robertson, died July 6, 1944 in Normandy France. His name is on the monument in Huddy Park. Pictures to follow. Leslie Layton I have his photo. And his memorial photo. Jessica Saul George K. Hauber was my uncle by marriage to my Dads sister. All my life i was told he was killed guarding the USS Hornet and his ship went down. His son & name sake have passed but Anna Mae VanSalisbury may have more info and photographs as it was her Mom. George was her 1\2 brother. Karen Irwin Oram-Proudfoot Did you get my Dad’s pic and one from Andor Orel? Dolores Howard‎ 19 years ago Nina got a letter from a school teacher in Marilyn . A student of her’s dug up 8 dog tags on the beach of Normandy. One of the tags belonged to my Uncle Willard Robertson. 51 years after his death. They came to Highlands and gave the tags to my family and I. The tags read, W B Robertson , 52167340 , next of kin Miss G. Robertson , 5th street, Highlands N. J. It was a very moving moment for all of us. I know how much my mother and her sisters loved their younger brother. My son has the tags and all his medals. This a very interesting story. Bob Mayers Dolores does anyone else in your family remember anything else about Willard who may have fallen on D Day. Dolores Howard He died on 7/6/44 the second wave on Normandy. He was in the tank division. I’m the last of my family. I know that his body was sent home years later. My mother and her sisters often wondered if they got his body or a bunch of rocks. When I saw the tags, I knew that his body was sent home. I have pictures of his wake and burial. I also have picture of him in England waiting to go Normandy. Bob Mayers Thanks Dolores, Willard was a true American hero. As I remember the 2nd wave at Normandy took 50% casualties. Stephen Ryder Layton I HAVE A NEWSPAPER ARTICAL THAT TELLS YOU ABOUT IT. Leslie Layton Willard Robertson’s mother was Harriet “Hattie” Layton-Robertson. My grand aunt. It sounds like Kim needs to get a lawyer and go to court. Way to treat a brand new business that is doing well and making the town look great. I was at the meeting and it was very discouraging to hear the details that a resident, a business owner and a landlord are being forced to endure. Code enforcement is essential to bringing Highlands back to shape … even Fran Mullen (the T&M FEMA team Mgr.) stated that for our PPDR program to demo Sandy impacted homes required an elevated code enforcement effort to make results happen. But not in this manner. Residents come to meeting after meeting with year’s of complaints & concerns of abandoned homes. Bay St. residents also attended the meeting stating they have filed complaints about serious Storm water management issues (for years). Their properties and structures are now damaged as a result. The SOP customer service response that ‘ we just heard about this … we’ll have a meeting and look into it’ does not cut it. Not after you hear the same issues and the same lack of results year after year. Code enforcement is necessary in a town with blight conditions …. BUT that does not mean ‘selective’ targeting based on the identities of residents who may have ruffled their feathers a bit. I wish I had a dollar for every time a resident expressed they are afraid to say anything for fear of negative consequences. And why the selective focus on businesses (who I guess are perceived as having deeper pockets?) Where are the appointed liaisons in communicating issues before it turns into a court situation? This businesses was taking temporary measures to IMPROVE their site, and with the proper permits secured before they started. Where is the town’s focus on those complaints on file for years where no action has been taken? What type of power trip is going on here? Needless to say last night’s meeting was as embarrassing as the WNS planning board meeting. One good thing from all of this is that the residents are getting more empowered and it is a breath of fresh air that our town officials are finally getting called out to do their job. I wouldn’t be so miffed about this if Et Al got caught up in a massive code enforcement crackdown. What’s really confusing is that once the permit was presented that this didn’t go away. Why are there still threats of fines and a needed court date for something the borough allowed? The permit states TBD. Not “TBD, but no later than…” It’s TBD, and Et Al is still determining the date. I don’t get it either. Let’s just say “someone” complained, and legitimately the permit was placed in the wrong file, when the administrator went down to speak to her, as he did, or when she called code enforcement, it should of been a “oops” let us make a copy of your permit and put it in our files. Having gone through something similar with the town, I hope she get’s a lawyer and the intimidation tactics start to get taken care of. This is not the way to run a town, or encourage people to move there or start businesses!